Despite the fact that many Australian native bees do not form a hive, and that the Blue-banded Bees have left the vicinity, the Blue-banded B&B recently described is still a hive of activity. The Blue-banded Bees have gone and so too have their parasitic predators, the Cuckoo Bees and the Gasteruptiid Wasps. The B&B is still buzzing though. At the base of the lime-mortared brickwork is a bluestone block, originally the base of the loading bay entrance. Drilled into the block for reasons time has forgotten are a series of holes. 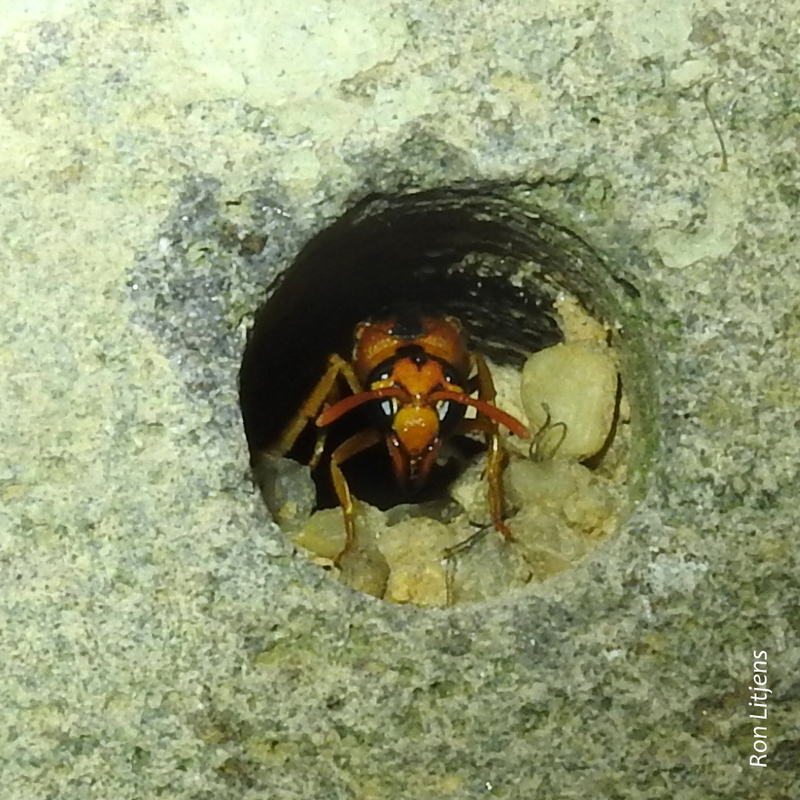 In recent days orange and black wasps have been building nests of mud in those holes. Also investigating the holes have been Cuckoo Wasps (I think), pictured left. They are not wingless although the photograph makes them look so. 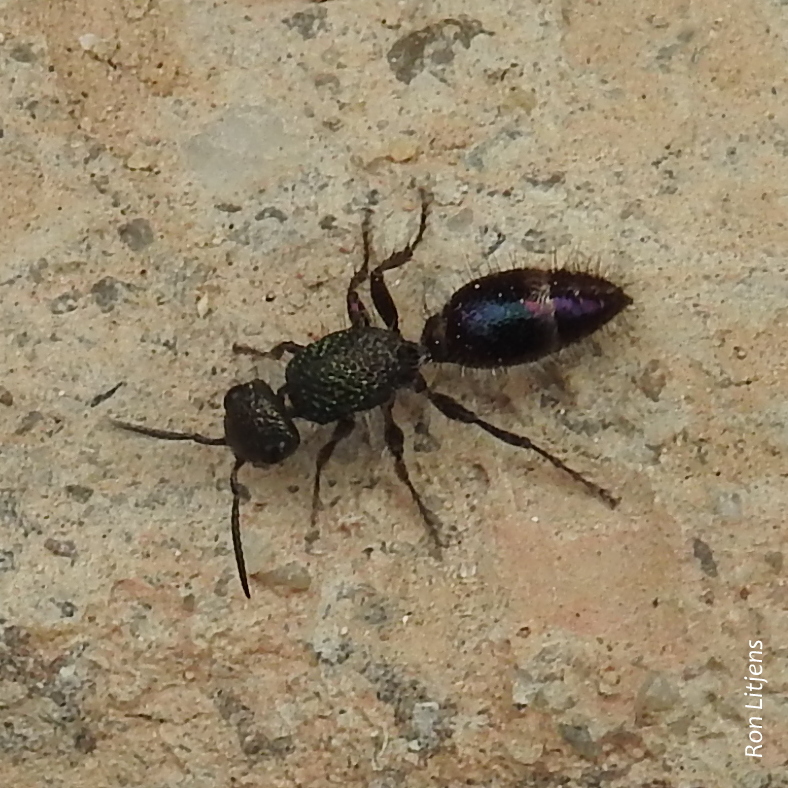 The Cuckoo Wasps have been busy checking all the holes … except one! Cuckoo Wasps are typically iridescent green or blue. As the name suggests they are a parasitic wasp laying their eggs in the nest of their host, in this case Mud-Dauber Wasps. When the Cuckoo Wasp eggs hatch the larvae eat the food that has been stored for the Mud-dauber young and then when the Mud-daubers larvae hatch they eat them as well. Back to the hole which was avoided by the Cuckoo Wasp … sitting inside was one of the orange and black wasps, no doubt protecting the nest. But for how long? At some point in time one imagines it will have to go out and feed and the Cuckoo Wasp will pounce. Unfortunately there’s no room service at the Blue-banded B&B.